We strive to offer a broad range of procedures so you can be comprehensively treated at Hermon Family Dental. We employ the latest techniques and equipment in order to deliver a high quality and safe treatment experience. If a case is exceedingly complex or specific we may refer to a specialist, as we want the best for all of our patients and promise to treat you as we would a member of our own family. When a tooth is fractured, broken, or has had a root canal treatment completed, it is weakened and susceptible to further damage. In order to protect the tooth and/or improve the appearance a crown may be indicated. First the tooth is carefully prepared for the crown. Then an impression is taken in order for the dental laboratory to fabricate the crown. Then a tooth colored temporary crown is fabricated and cemented onto the tooth. 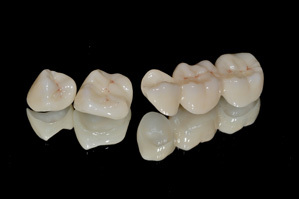 In about 2 weeks or less the permanent crown is cemented with very strong cement. The crowned tooth is now safe to chew with and can be treated just like a natural tooth. Every tooth has a root and inside every root is a canal where the nerve is located. When the nerve becomes irreversibly inflamed or infected it needs to be removed. Once the nerve is removed the inside of the tooth is disinfected, shaped, and filled so that no bacteria can re-infect. Unfortunately root canals get a bad reputation for being very painful. The truth is that as long as every effort is made to numb the tooth, most of the time the procedure should feel no different than getting a filling. The Doctor will make every effort to be sure that you have adequate anesthesia as you lie comfortably in the chair. After the root canal has been treated the tooth will almost always require a crown in order to protect it from fracturing. When many teeth are missing, dentures or partials can replace them. 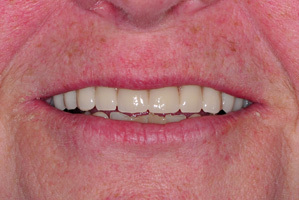 A well-made set of dentures or partials should fit well and appear so natural that most people would never even know. When a tooth is not restorable or needs to be removed, an extraction is needed. 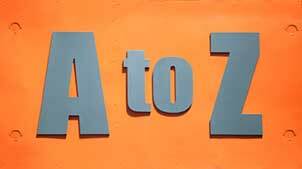 Like every other dental procedure, you should have profound anesthesia, meaning you’ll be very numb. It is however normal to feel some pressure during an extraction, but if at any point you experience real pain all you need to do is let the Doctor know and they will immediately stop and make sure you get completely numb. 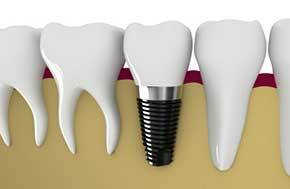 Dental Implants are an excellent option to replace missing or unrestorable teeth. Implants are one of the longest lasting treatment options available and often do not need replacement like so many of the other options. Implants should be cared for much like your natural teeth and because they look so real, only you and your dentist will know it’s not your natural tooth. Implants can also be used to attain stability and retention for dentures, especially in lower dentures.